Our repairs come with a 2-Year Guarantee! At Ottawa Driveway Experts we only use Hot-Applied Elastomeric Compound as we have found that this rubber compound is best for Ottawa’s colder climates. This fantastic product has an elasticity that remains flexible at -40° and it will not break or crack making it ideal for asphalt crack repairs. This sealant is ready for traffic within minutes and will not track, pick up or bleed. Although specialized equipment and experience is required for applying this sealant, it is extremely cost effective as it will outperform every other system by years. It is the same system that the City of Ottawa uses to seal cracks on roadways. 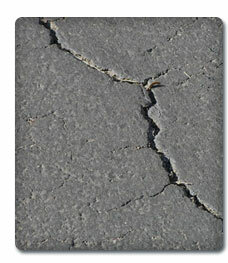 • all cracks (less than 3/8″ wide) are routed to provide a reservoir for the sealant. • all cracks are blasted clean and dried with a high velocity compressed air. • we melt the sealant in a kettle to an exact temperature then transfer it to a heat applicator squeegee machine. • finally the squeegee machine applies the sealant to the prepared crack.